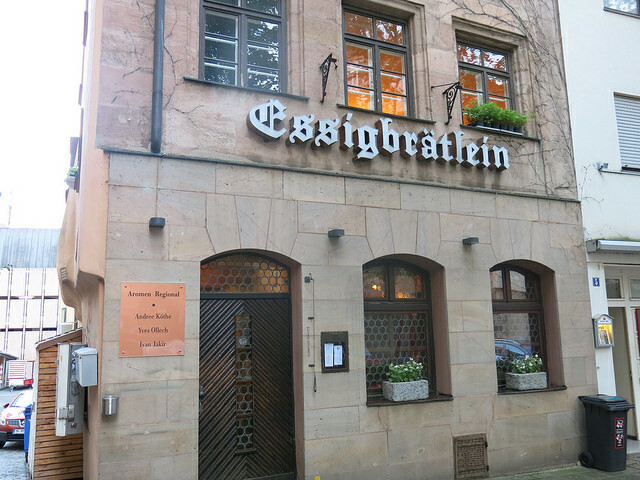 We visited restaurant Essigbrätlein during a relaxing weekend with friends in Nürnberg. Looking to the reference list of the restaurant this would be the absolute highlight of the weekend: two stars in the Michelin Guide, a score of 18/20 with Gault&Millau and “Koch des Jahres 2012“ with Gault&Millau. We were ready for an amazing German food adventure! From the outside, this small and quiet establishment does not seem to be a hidden gastronomical gem. However, the positive recommendations that we received reflect the opposite. 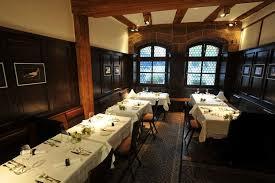 The building represents over 500 years gastronomical history. From 1550 towards 1989, it was a reference for several culinary projects. Chef and initiator Andree Köthe started his project in 1989 and the 20 seat restaurant evolved towards a top-gastronomy restaurant. 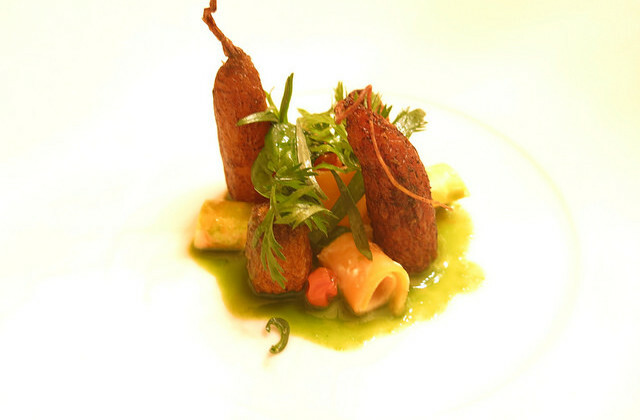 Chef Köthe is a self-taught chef and he was accompanied in 1997 by chef de cuisine Yves Ollech. Ollech gained experience in several well-reputed restaurants like Adler, Landgasthof Schober and Schweizer Stuben from Fritz Schilling. 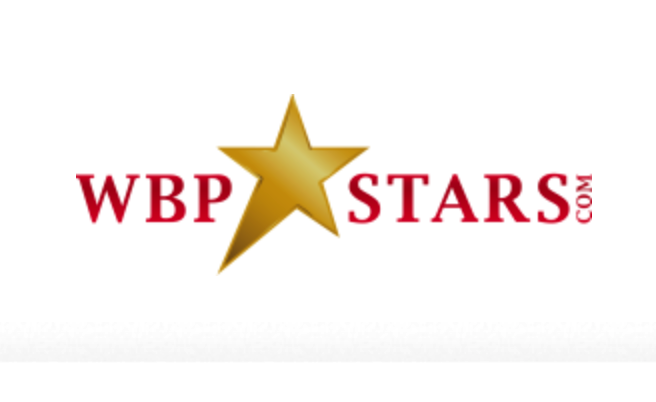 Only two years later this duo was awarded their first Michelin star and a second star in 2008. The wood panelling of the small interior makes the room very charming and cosy. The restaurant only seats 20 guests on the ground floor and on the first floor there is a private dining room for up to 10 people which misses a bit of stylish interior design. We were surprised to be seated in the private dining room at a big table while we were only four covers. We really missed the atmosphere of the small and bustling dining room. A bit of background music in that room would also be highly recommended. The cooking style of Essigbrätlein is totally not German. 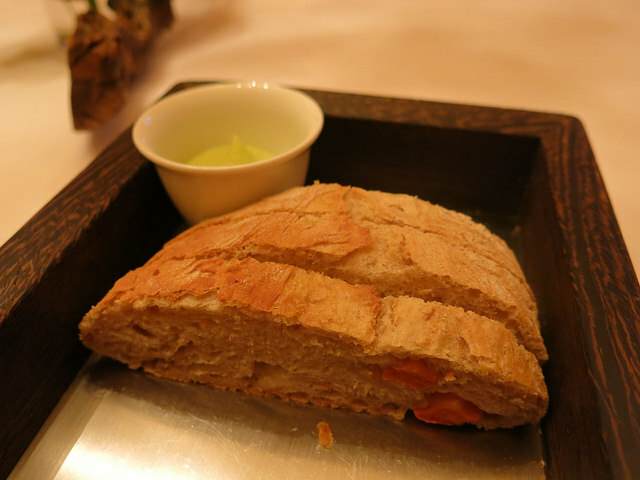 Their “Gewürzküche” is very creative and uses innovation with vegetables, spices and herbs. 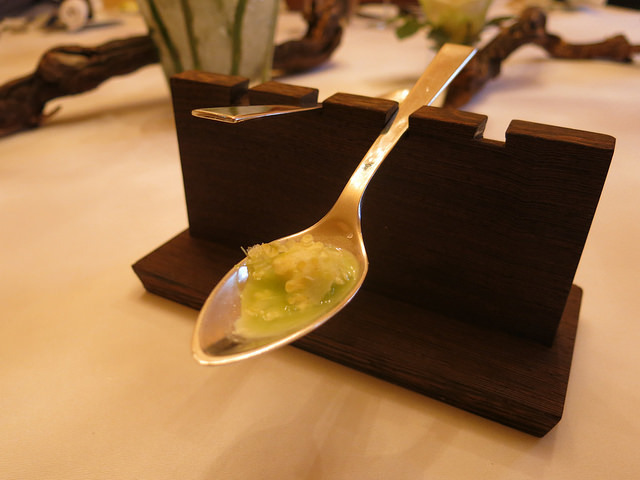 Essigbratlein serves only one tasting menu (142€), which changes from one day to the other, depending on which ingredients inspire both chefs at that moment. A wine pairing with the 7-course menu is rather on the expensive side (80€). As an aperitif we follow the suggestion of the day, which was a combination of Riesling wine with Orange liquor and bitters (16€). 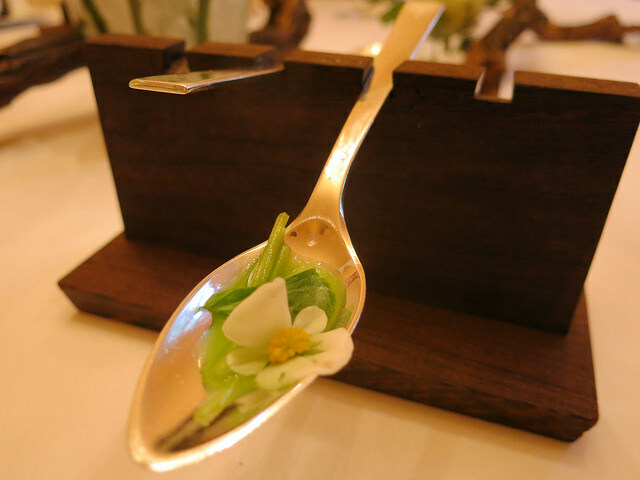 With the appetizers both chefs show already their cooking style and serve creative pairings of vegetables, flowers and herbs. The taste does however not fully convince us yet. 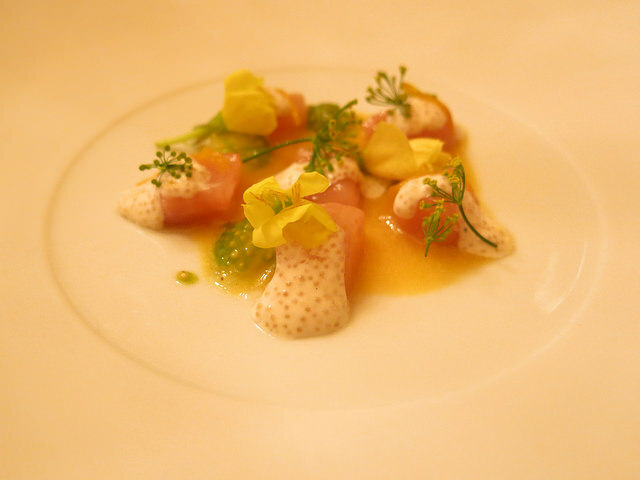 As first dish, marinated Lake trout, comes with yellow tomatoes, a juice of yellow tomatoes, amaranth, dill flower and sunflower. 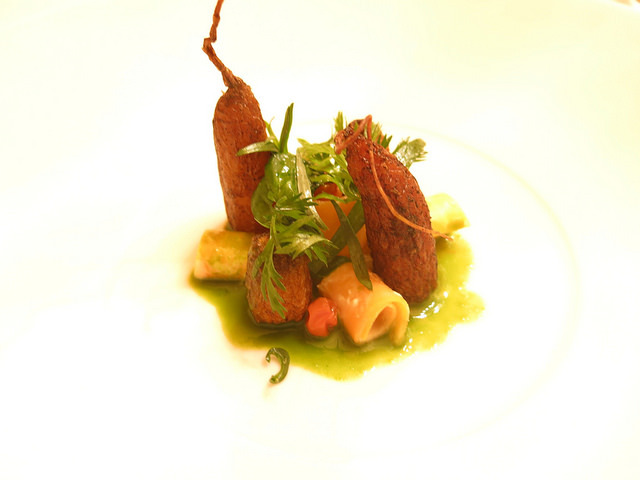 The nicely presented dish shows freshness, acidity and delicious natural flavours. The wine list shows a wide selection of Riesling wines and we selected an excellent Centgrafenberg GG riesling 2011 from Rudolf Fürst, Bürgstadt with great minerality and fruitiness (79€). 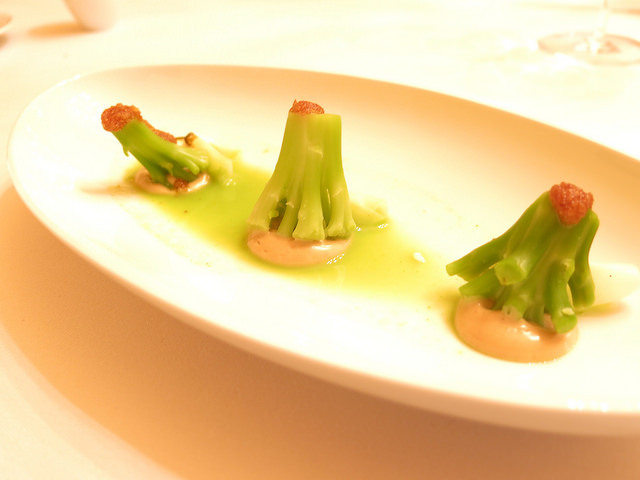 Vegetarian creativity is one of the signatures of restaurant Essigbrätlein and a great example is our second course with green beans. 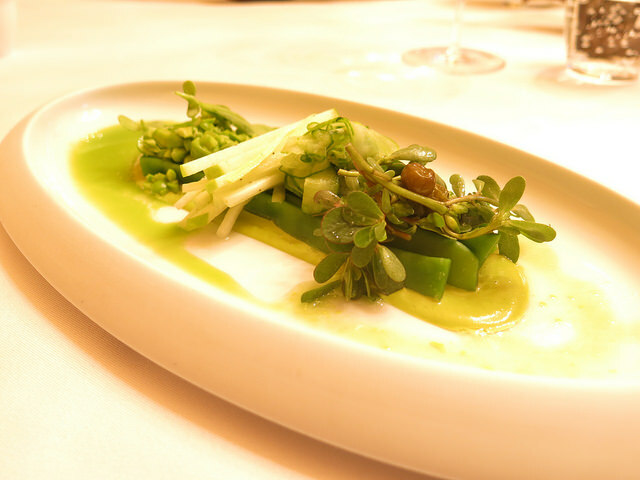 On top of the perfectly cooked green beans you have a pairing with granny smith julienne, pistachio cream, green peas, marinated grapes, peas sprouts, marinated cucumber with coriander and purslane. The ingredients still had a crunchy, fresh and intense taste while the soft pistachio cream gives a great counter balance. Unfortunately the next part impresses much less: broccoli with breadcream, ricotta and cherry flower. The dish misses power, richness and is quiet monotonous. 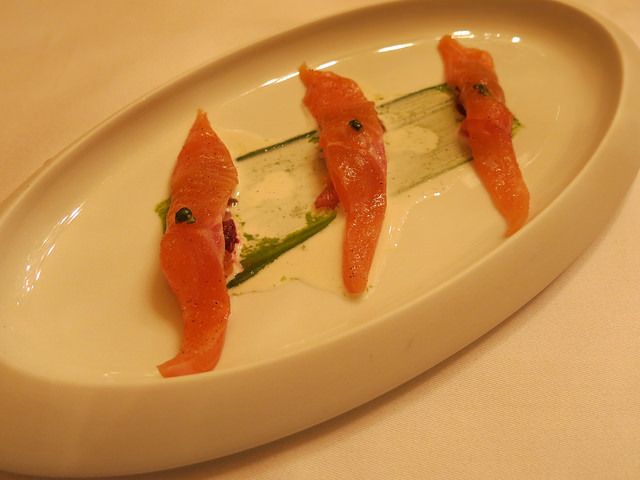 A simple presentation of smoked char fish with beetroot, grapefruit and tomato has delicate and lovely flavours. Fermented carrots come with herbs, yoghurt, garlic and rowan. 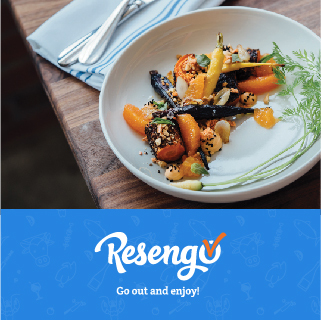 The carrots have an intense taste through the fermentation while the little berries give the dish the needed acidity. 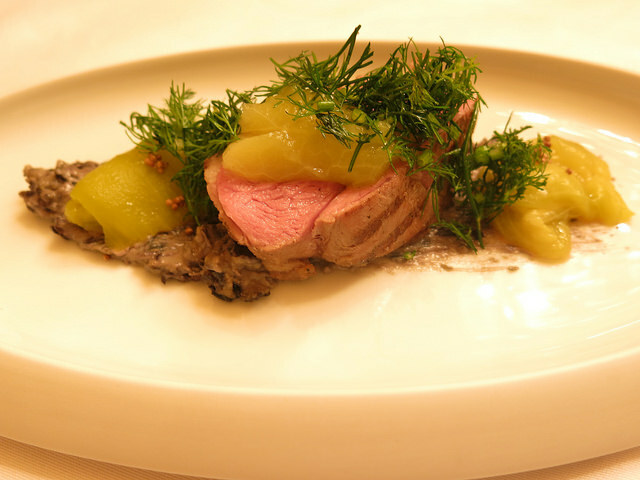 A great piece of lamb is juicy and served with eggplant, pickled eggplant and an overload of dill. We ordered a Vertente from Niepoort in the Douro region of Portugal (59€). This elegant assemblage from Tinta Amarela, Tinta Roriz and Touriga Franc has rich aromas of berries and an elegant finish. 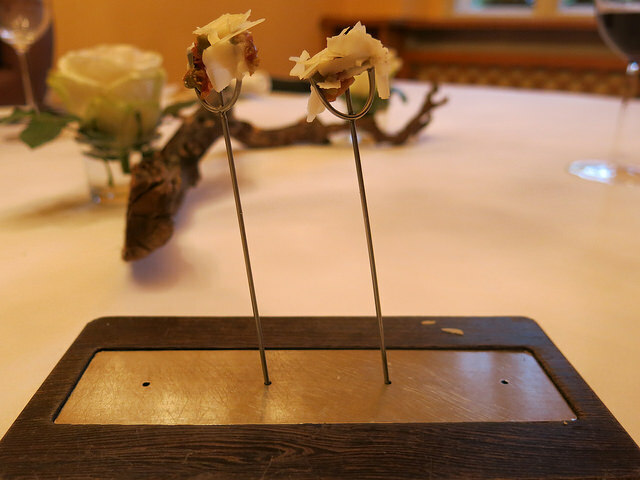 We were hoping that we would finish the German gourmet evening with a stunning vegetable dessert, but unfortunately the last part of the menu did not meet our expectations. 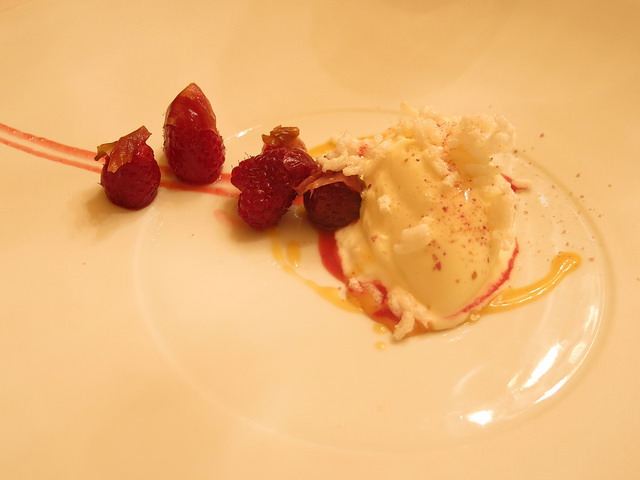 Raspberries were served with rice-ice cream and puffed rice. I just did not like the taste of the ice cream. 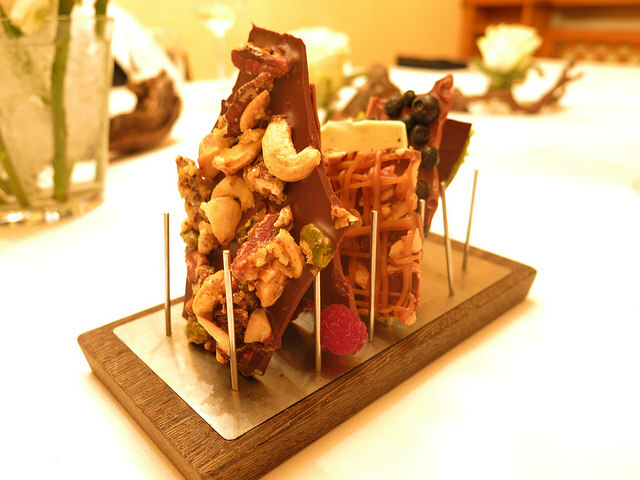 The coffee and tea service is accompanied with several delicious pieces of homemade chocolate bars. Our compliments to the team by keeping a perfect speed and timing in service. 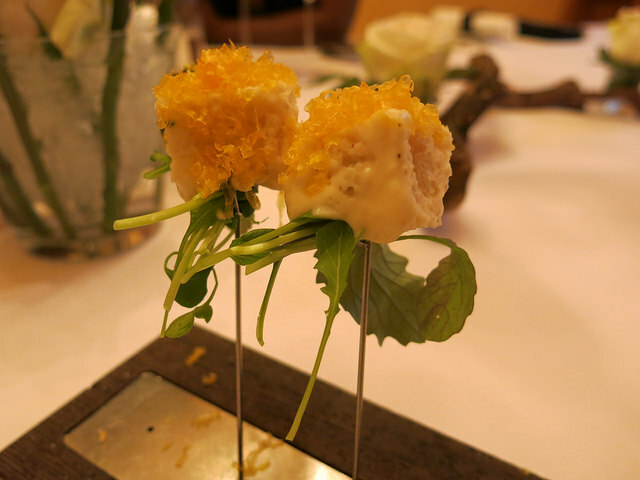 Köthe and Ollech have been setting a trend in German gastronomy with their innovative use of vegetables and use of local ingredients. They managed to create a clear signature of what their cooking style stands for. We enjoyed the creativity in some of the dishes but we often missed intensity in flavours and a finishing touch to be quoted outstanding. 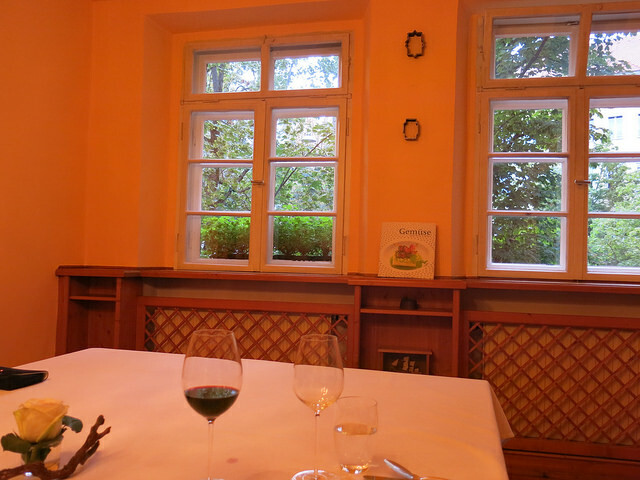 With more refining and experience building, restaurant Essigbrätlein can convince much more and meet the expectation we have from a two star or 18/20 scored restaurant. Last updated by begusto at 22/02/2016 .